The Illuminati. The Illuminati are the ones controlling world affairs through present day governments and corporations and are behind events that will lead to the establishment of a New World Order. There is a worldwide conspiracy being orchestrated by an extremely powerful and influential group of genetically-related individuals (at least at the highest echelons) which include many of the world's wealthiest people, top political leaders, and corporate elite, as well as members of the so-called Black Nobility of Europe (dominated by the British Crown. The Luciferian Agenda of the Secret Societies that are planning this New World Order is to have a World Government, World Religion, World Army, World Central Bank, World Currency and a micro-chipped population. This New World Order global government will be a fulfillment of bible prophecy concerning the last days. Daniel 8: 23 Rev. 13: 4, 5, 7 While the name New World Order is a term frequently used today when referring to this group, it's more useful to identify the principal organization that makes up this vast interlocking spiderweb of elite conspirators. The Illuminati is the oldest term commonly used to refer to the 13 bloodline families (and their offshoots) that make up a major portion of this controlling elite. 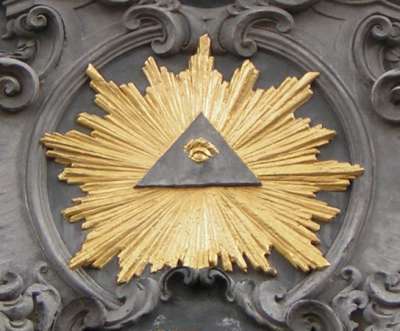 Most members of the Illuminati are also members in the highest ranks of numerous secretive and occult societies which in many cases extend straight back into the ancient world. 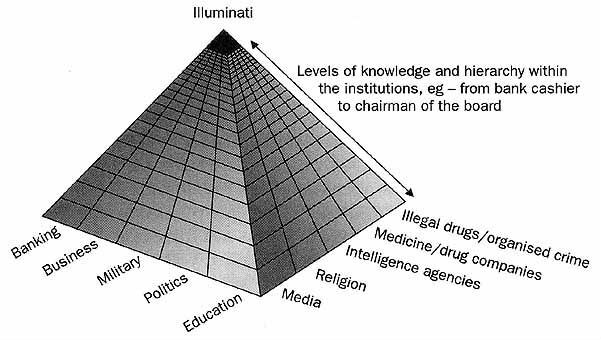 The upper levels of the tightly compartmentalized (need-to-know-basis) Illuminati structural pyramid include planning committees and organizations that the public has little or no knowledge of. Their goals are: a One World Government and One-Unit Monetary System, under permanent non-elected hereditary oligarchists who self-select from among their numbers in the form of a feudal system as it was in the Middle Ages. In this One World entity, population will be limited by restrictions on the number of children per family, diseases, wars, famines, until 1 billion people who are useful to the ruling class, in areas which will be strictly and clearly defined, remain as the total world population. There will be no middle class, only rulers and the servants. All laws will be uniform under a legal system of world courts practicing the same unified code of laws, backed up by a One World Government police force and a One World unified military to enforce laws in all former countries where no national boundaries shall exist. The system will be on the basis of a welfare state; those who are obedient and subservient to the one world government will be rewarded with the means to live; those who are rebellious will simple be starved to death or be declared outlaws, thus a target for anyone who wishes to kill them. Privately owned firearms or weapons of any kind will be prohibited.